Yellow line shows current data, blue line shows the last year-same date information, for direct comparison. The current month and current year plot charts are updated once a day only. In the last three days charts, vertical light green lines are midnights and dark green vertical lines are noons. 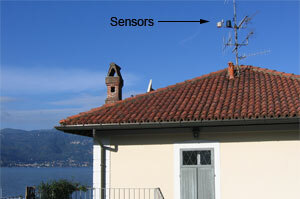 Images and weather information automatically update every 30 seconds. It does not work all times (please verify date and time in the pictures). How data are gathered? 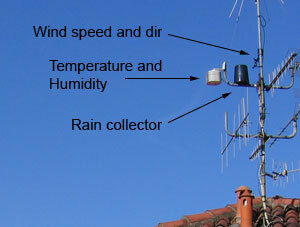 The system is made with a Davis Weather Monitor II weather station connected to a PC that collects information since 1999 and displays a slideshow of the charts. The PC screen is then modulated in the television home plant, allowing to see it from any TV set. The charts are saved in jpeg format and sent via ftp at every update by an another application in order to have all charts available at the same time. I self developed the application that grabs the image from the webcam (Creative NX Ultra) and saves it in jpeg format, as all the available applications I found on the internet weren't enough stable. CerroMeteo, except for other indications of law, cannot be thought in any way directly responsible of any damages of any nature caused directly or indirectly from the access to the website, of the inability or impossibility to access the website, of the reliability of the news contained in it and their employment. CerroMeteo provides to supply in the website updated information as much as possible, but does not guarantee its thoroughness or accuracy. In particular it spreads such information in order to popularize it, which does not constitute therefore a source of right. It is recommended therefore, whereby appropriated, to consult the official sources. CerroMeteo reserves the right to anytime modify the contents of this page and without any warning. The links to external websites are supplied only as plain services the customers, excluding any responsibility on the accuracy and the thoroughness of the whole reported links. The information reported in the external links does not imply for CerroMeteo side, any type of approval or sharing of responsibility in relation to the thoroughness and the accuracy of the information contained in the indicated links. Every kind of mirroring (duplication) on other websites is prohibited, unless specific agreements with the editorial unit.